The body needs some cholesterol to function properly, but you can have too much of this good thing. Too much cholesterol leads to plaque formations in the arteries which can cut into blood flow to the heart. Over time this can result in heart disease. When you have bloodwork done and get cholesterol numbers, there are at least five of them. These are confusing to a lot of folks. My latest numbers included Cholesterol, Triglycerides, HDL and LDL Cholesterol and Non-HDL Cholesterol. The number most people focus on is Total Cholesterol which is generally recommended to be around 200 or below. However, the total cholesterol number is not at all the most important. Here is why. You have two kinds of cholesterol in this series. The first is HDL – High Density Lipoprotein the second LDL -Low Density Lipoprotein. Web MD says, “Low density lipoproteins (LDL): also called “bad” cholesterol, can cause buildup of plaque on the walls of arteries. The more LDL there is in the blood, the greater the risk of heart disease. 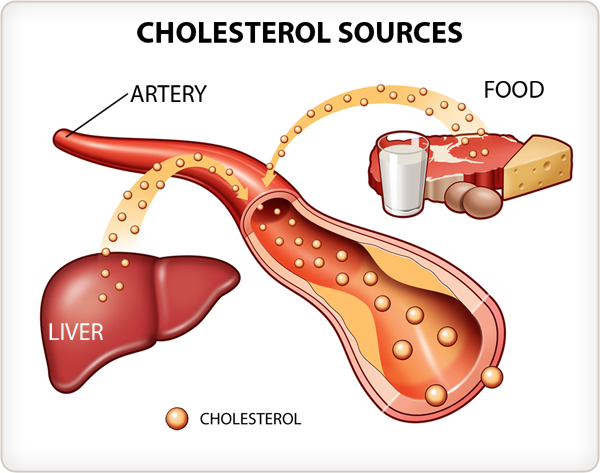 “High density lipoproteins (HDL): also called “good” cholesterol, helps the body get rid of bad cholesterol in the blood. The higher the level of HDL cholesterol, the better. If levels of HDL are low, the risk of heart disease increases. I have bloodwork done at least once a year and usually more often. I wrote about my last doctor visit in June of this year in What do you look for in a cholesterol report? Here are my numbers from that visit. My cholesterol ratio (see above) is 85 (HDL) divided into 197 (Total) for a 2.32 ratio, well below the recommended one. • Eat low-cholesterol foods. The American Heart Association recommends that you limit your average daily cholesterol intake to less than 300 milligrams. If you have heart disease, limit daily intake to less than 200 milligrams. People can significantly lower their dietary cholesterol intake by keeping their dietary intake of saturated fats low and by avoiding foods that are high in saturated fat and that contain substantial amounts of dietary cholesterol. • Quit smoking. Smoking lowers HDL (“good”) cholesterol levels. This trend can be reversed if you quit smoking. • Exercise. Exercise increases HDL cholesterol in some people. Even moderate-intensity activities, if done daily, can help control weight, diabetes, and high blood pressure — all risk factors for heart disease. • Take medication as prescribed by your doctor. Sometimes making changes to your diet and increasing exercise is not enough to bring cholesterol down. You may also need to take a cholesterol-lowering drug. Besides the four excellent recommendations on lowering your cholesterol from WebMD listed, I would like to add that I consume several tablespoons of coconut oil every day. I discovered coconut oil in April of this year and you can read about it on this Page Why you should include coconut oil in your diet. From April till June when I got my bloodwork done, I had begun to include coconut oil in my diet. I would have a tablespoon or two every morning. In addition, I also cooked with it whenever possible. You can see my recipe for Hawaiian pasta which I wrote about in May. I also use it for popcorn which I eat most nights. Although I have only had a couple of months of coconut oil consumption, I reduced my total cholesterol and increased HDL cholesterol and the important cholesterol ratio. Check it out. You might have good results, too.